You know what your “boogie shoes” are. That perfect pair that never show signs of wear, that make you look your best and oh yeah – never seem to hurt no matter how many times you’ve spun around the dance floor. Your wedding day is no different. Make sure you’re not only picking the perfect pair of shoes for your dress and wedding style – but make sure they’re a pair that will last all day and night for you. Oh, sure, you could throw on slipper or flip flops at the end of the night…but REALLY? Is that the classy bride you want to be? Spend some extra time finding the perfect pair that can stay ON your feet and keep you looking fabulous the entire day. Don’t let your shoes get in the way of your wedding style. 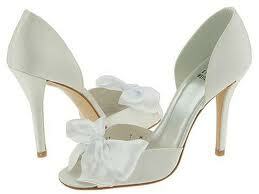 Get the wedding shoe comfort accessories you need to stay fabulous! Wedding shows can be one of the biggest resources to you during your wedding planning experience. If you know how to navigate the waters efficiently, they can turn a random Saturday afternoon into a productive wedding planning day. Don’t let those few hours slip by and be a waste of your parking ramp fees – use wedding shows to your advantage! Have in your head (or even better – on a list!) what vendors you want to look for/talk to, what questions you have and what you’re looking to accomplish during the show.A wedding show can get overwhelming with all of the vendors there, all the things to look at, taste, etc. Make sure you have an agenda in mind so you can make the best use or your time – as well as the vendors who are there to work. Most shows have a website where you can check out which vendors are going to be there. Note those that you’re interested in in advance so you’re fully prepared for the room in front of you. A great tip to take advantage of is pre-printing some mail labels with your name, address, phone number, email and wedding date/location. These will come in handy in a super way when you want to give your name to vendors that you’re interested in as well as when you want to put your name in every drawing that vendors have at their booths. This way, you won’t waste time filling out entry form after entry form instead of just slapping the label on the piece of paper. 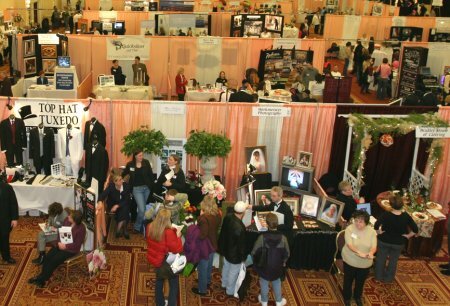 Vendors participate in wedding shows in order to get business, obviously. And the primary reason for brides to attend is to connect with vendors in a sort of “speed dating” fashion in order to maybe book a few for their own wedding. However, if youw ant to really utilize the resource of a wedding show – look deeper than just vendors who you want to book.Vendors typically will have pictures of weddings they’ve worked in the past at their booth, or little vingettes of ideas for their service. Learn to look beyond the vendor and their direct service to glean ideas, inspiration and advice from their displays, pictures and comments to you. Go ahead and even ask questions – use the vendors as a resource and if you like them, contact them after and even book them! They want to help and gain your trust – whether for your wedding or for your referrals. Vendors are at theses shows to gain business. Period. Let them take the lead when it comes to following up after the show. Sure, give them your information – but then wait for them to get to you about following through. It takes the pressure off of you and lets them take the reigns. Don’t feel like you have to book aevery vendor you speak with – let them come after you. Definitely go to a wedding show or two during your engagement – you never know what you can find there. Take a girlfriend or bridesmaid, have fun and enjoy the process! Congratulations, bride! It’s your time and it’s an exciting one, for sure! Planning a wedding is a wonderful, wonderful experience that you won’t soon forget. Hopefully you’re enjoying parts of it – but we know it can be overwhelming. That’s what we’re here for. Bride Support is a virtual wedding planning service to get you the personal wedding help that you need…when you need it. Confused about your timeline? Not sure how those centerpieces will work? Need someone to let your MOH know her duties? That’s where we come in. Wedding planning connoisseurs that are on your side. So let us get to work and you get back to enjoying your engagement.